The EUR 100 million project of Samvardhana Motherson Peguform (SMP) belonging to the Samvardhana Motherson Group (SMG) has been completed. 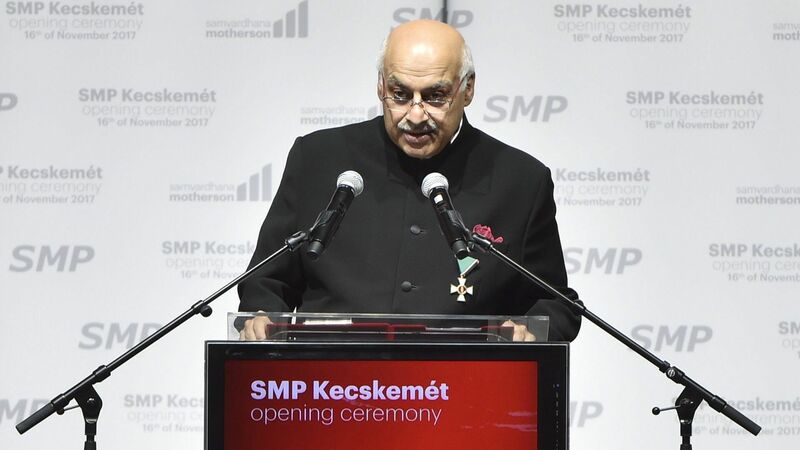 As a result of the project, which received the 'Largest Greenfield Project of the Year Award' in 2015, the Indian-based automotive supplier has established a bumper manufacturing plant in Kecskemét in an area of 96,000 square metres. The Hungarian government – in cooperation with the Hungarian Investment Promotion Agency (HIPA) – provided subsidy based on an individual government decision to SMP, for the development rated as a high-priority project for the national economy, which creates about half thousand jobs. Established in 1975, the Samvardhana Motherson Group (SMG) is a global automotive supplier. Its business portfolio covers a wide range of products worldwide for all major carmakers: driving cabs, bumper covers, rear-view mirrors, camera systems, lighting systems, interior and exterior upholstery, cable systems, air conditioning systems and all-terrain driving cabs. In addition, the SMG also provides a full range of IT and design engineering services to various industrial segments. The SMG is one of the world's 30 largest automotive suppliers, employing more than 100,000 people in 33 countries on five continents. The Group generated a sales revenue of USD 9.1 billion in the 2016/17 business year. As a subsidiary of Samvardhana Motherson Reflectec (SMR), Samvardhana Motherson Peguform (SMP) is one of the world's leading experts in the field of plastic technologies. In addition, it is considered one of the world's largest suppliers in the areas of car upholstery, dashboard and bumpers. The SMG bought up the company of German origin in 2011; it is present with twenty-seven manufacturing units and nine module centres in nine countries. The number of its employees is over 14,000. Its revenue was nearly EUR 3 billion in the 2016/17 business year. As a strategic partner of the Hungarian government, the SMR has been continuously expanding its domestic presence since 2015. However, as part of this, they not only increase existing manufacturing capacities, but also add new activities to their Mosonszolnok, Mosonmagyaróvár, Győr, Túrkeve and Kecskemét units year after year. Based on the latest announcement made in August 2017, more than 400 jobs in total were created by two simultaneous developments in Túrkeve, in addition to increasing the manufacture of rear-view mirrors and bumpers. With the current project, a bumper manufacturing plant is established in Kecskemét in an area of 96,000 square-metres, from which they can handle the orders of their partners located in our country and in the region even more efficiently and flexibly. The EUR 100 million development results in the creation of more than 450 new jobs.